What Kind of Light Does a Solar Cell Need? Harnessing energy from the sun is becoming more and more important as society makes increasing demands for electricity. 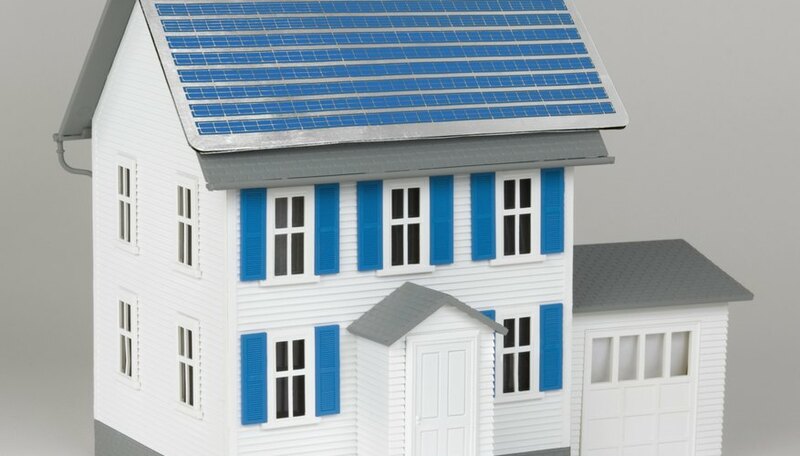 Using a scale model house, photovoltaic cells and light emitting diodes (LEDs), you can make a model demonstrating the conversion of light into electricity. Then you can show your project to your science class or enter it in a science fair. Glue six solar cells to the slanted roof of a model house. Note that each cell has a positive (+) and a negative (-) terminal. Mount them so that the positive terminal on each cell is near the peak of the roof. Connect a short piece of hook-up wire from the negative terminal of the first cell to the positive terminal on the second cell using a soldering pencil. Use your wire cutter to strip 1/2 inch of insulation off of each end of the piece of wire. Similarly, connect the negative terminal of the second cell to the positive terminal of the third; the negative of the third to the positive of the fourth, and so on. This places the solar cells in a series, which adds together the voltage generated by each cell. Each of these cells produces about a half volt of electricity, so your solar array will generate about 3 volts (.5 volts times six cells). The positive terminal of the first cell and the negative terminal of the sixth cell will not have any connections at this time. Place two white LED lights inside the model house, perhaps placing one in the living room and one in the bedroom, and glue them into position. Solder a piece of hook-up wire from the positive terminal on the first solar cell to the positive lead on one of the LEDs. Solder another piece of hook-up wire from the positive terminal on the first solar cell to the positive lead on the other LED. LED leads have polarity, as do solar cells. The LED package they come in will show you how to identify which of the LED leads is positive and which is negative, as there are several different indicators that manufacturers may use. Solder a piece of hook-up wire from the negative terminal on the sixth solar cell to the negative lead on one of the LEDs, and solder another piece of hook-up wire from the negative terminal on the sixth solar cell to the negative lead on the other LED. This places the LEDs in parallel with the solar array. Place a desk lamp near the model house and turn on the light, representing the sun. The lights in the house will go on. This circuit will produce enough current to add a few more LEDs if you want to expand your project. Use caution when working with a hot soldering pencil. Dan Keen is the publisher and editor of a county newspaper in New Jersey. For over 30 years he has written books and magazine articles for such publishers as McGraw-Hill. Keen holds a degree in electronics, was chief engineer for two radio stations and taught computer science at Stockton State College. Keen, Dan. "How to Build a Model Solar House for a Kid's Project." Sciencing, https://sciencing.com/build-solar-house-kids-project-8780591.html. 25 April 2017.